In this pursuit of excellence, Bilstein has received worldwide acclaim for quality shock absorbers that have set new industry standards. Setting high standards has always been a top priority with Bilstein and a consistent set of parameters and performance guidelines go into the development of each Bilstein shock application. 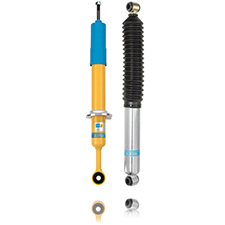 Bilstein B4 OE Replacement series provides the same OEM quality and ride stability for the aftermarket. Bilstein uses both monotube and twin-tube technology to give the best in OE replacement driving comfort at a great economical price. Bilstein B6 Performance series is the best solution to improve your car’s ride by enhancing the performance of your system system. With amazing control, precise handling, and top end comfort, you'll soon discover there is, quite literally, nothing like it. Bilstein B8 Series is designed to enhance your car’s lowered suspension, Bilstein's monotube gas pressure technology delivers a sporty ride with remarkable comfort.